Issue is that they have a lot of class but seem to give up at crucial moments. What I am really happy about is the captain - Imad Wasim - I see a lot of toughness in him and I do hope he can himself inspire his side to become title holders. Babar Azam should be made VC. Decent side with some really good overseas T20 batsmen. Also would be great to see Wasim Akram working with Mohammad Amir and helping him find his lost form. Straight swap with LQ in the league table. mmm, if Malik isn't there, they have a chance. Imad is going to be very important to their success. He played some good innings vs SA and he needs to replicate that form as KK lack firepower at the end. Strong opening partnership in Munro and Babar though. I think people are overreacting. This team is fine, after all they have the best player in the world, they will be competitive. Babar needs to carry his international form into the league and give KK some firing starts along with Munroe. Always a lot of hype for this team but they fail to live up to the hype. Munro is a good addition. Raza too. Imad and Usama Mir is a good spin attack. Don't see them winning it to be honest. Less boring than the Peshawar Zalmi team, but still not those big scoring T20 bats. I will watch their games for Babar Azam's sake and to have a look at Imad's captaincy. My team is Lahore Qalandars but my two favorite Pakistani Players (Babar and Amir) play for this team. Still hoping Babar Blasts a couple hundreds against teams other than Qalandars. Surprised by the doom and gloom of some posters. @Arsalan Pro good write up, agree with a lot of what you have said. However, saying KK have "no really good quality spinners to bowl in the middle overs" is a little harsh. Usama Mir is a quality prospect and improves every time I have seen him, they just need to give him a bit of confidence. Umer Khan could also be a surprise package re spin. Agree with your concern re lower order hitting but I think that is addressed with the below line up, personally I think Yamin has to play over Bopara to get the balance right. They also have Ben Dunk and Liam Livingstone on the bench! One area I disagree with you is when you say it is a batting order filled with accumulators- five of that top eight can muscle the ball, whilst three can build a platform. If anything, their problem will be making sure at least one batsmen is anchoring whilst the rest have fun! (iii) batting is dependent on batsmen unfamiliar with conditions. Having sang KK's praises, they will now proceed to play cha cha Ifti and Sohail Khan . p.s. the one thing I will say about KK is they seem to lack any kind of "soul". Come across as very corporate e.t.c. Last edited by mak36; 11th February 2019 at 19:33. I don't like seeing Ali Imran in the starting 11. I'd rather bench Usama Mir and play Abrar in his place instead of sacrificing a crucial place in the middle order. Unless he has improved massively, playing Abrar would be a risk. If you want an emerging pick other than Ali Imran, play Umer Khan. Abrar impressed me in the 2nd season. So i'd like to see him play. I also agree with you on most parts, but whenever I have seen Usama Mir bowl in PSL, his lengths have been too short due to his height maybe and has gone for runs rather than being economical. Yes, but I do believe and hope that he is a good bowler who develops into a quality one by improving his consistency. As far as I know, Colin Munro isn't starting PSL straightaway and will miss 3-4 opening matches due to Bangladesh series, where he will only play 1 match which is the last of the series. Your team combination is good and can be even better in my opinion with some minor changes, but I don't think they will play these lineups which we want and I can't really expect big hitting from a batting order of Raza, Bopara, Rizwan at 4,5,6 which is the likely combination. Spot on re Usama's issue but I saw him bowl in the recent National T20 and he was bowling with much better control and was consistently bowling that fuller length. Here's hoping he can replicate that in PSL. Was not aware re Munro's availability. That could cause problems. What would your ideal XI be? For me, Rizwan isn't a suitable batsman for T20 cricket and should stick to ODIs only. He shouldn't be in their best possible lineup, they have Ben Dunk who is a wicketkeeper, a big hitter and can also play at different positions according to situation. Hence, only one of Sikander Raza and Ravi Bopara should play in the middle order. I actually agree with you re Rizwan- I somehow completely forgot Dunk is a keeper so assumed Rizwan was the only choice lol. Only issue with above line up is four of the top six are foreign and therefore less familiar with conditions but that's a risk worth taking. Once Dunk finishes in BBL he should definitely play. I just checked and it looks like both Summers and Dunk are also not available for KK's first game atleast, their teams are facing off in Semi-Finals of BBL on Thursday against each other, which is the fist day of PSL and Karachi has a match next day, although due to time difference one of them should make it to UAE by the time match starts but it will be pretty difficult for him to play right away, other player will play the Final and would reach next week most probably. 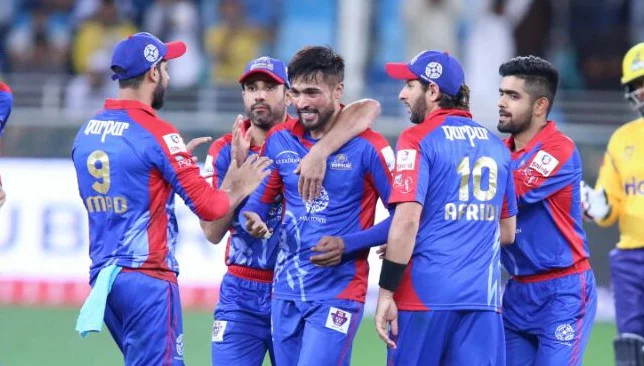 Karachi Kings should be one of the favs to lift the trophy. Looking forward to see Babar Azam carry his form from International Cricket to PSL... I expect him to be the player of the Tournament.. Very good team that should play to win tournament. Big test for Mickey he has to get far to show his worth in his 4th shot as teams coach. Babar and Munro can be a very powerful opening combination. Squad looks better and more balanced than previous seasons. Looks good. We should win this time. Would be good for Babar Azam's form and confidence if he can be a big contributor to his team's success. Ben Dunk scored a 50 in BBL final. On his way to Dubai, so here's hoping he plays. If Ben Dunk plays, he'll be replacing one of Bopara/Raza, the other being replaced by Munro and a local batsman will come in for Rizwan but all of them are openeners (Dunk, Munro, Awais/Imran) so most of their batsmen will be playing out of position. I think Livingstone and Babar is a solid opening partnership. They performed well together when they opened for the first time. I would like to see them continue together. They could easily bring Munro No.3, Bopara No.4 and Ingram at No.5. I personally would like to see Dunk and Aaron Summers play but I don't know for who. Still need a wicketkeeper since Dunk hasn't really been keeping recently, so it will likely still be that Rizwan will play instead of Imran or Zia. The batting looks strong though with Munro back to help give explosive starts. Bowling would be better if there was a better fast bowler than Sohail Khan available. Yup, he will be available for their next game and so will be Munro. I hope they drop Rizwan, who isn't suited to T20 cricket and will only lose them matches. In my opinion, they should also play Usama Mir from now on and go with 3 pacer, 3 spinner combination. Would play Shinwari ahead of Sohail Khan but otherwise agree (Usama Mir can bat at eight).